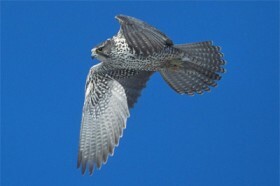 Other names: Greenland falcon, bird of kings, “Gyr” for short. Hunting habits: Mostly birds, especially ptarmigans and grouse. Also alcids, gulls, jaegers, ducks, shorebirds, and snow buntings. Migrating habits: A rare migrant at Hawk Ridge. Most often recorded late in the fall. Individuals have wintered in the Duluth/Superior harbor, feeding on pigeons. Nesting habits: Usually nests on tall cliff ledge with protective overhang. Just makes a scrape in which to lay eggs (usually 4). Female does most of the incubating–it takes the eggs about 28 days to hatch, and the young first fly when about 46-49 days old. Weight: females about 1400-2100 grams; males 1000-1300 grams. In the world of raptors, females are bigger, stronger, and usually more aggressive than males.